In this article, The ZMan walks through the final steps required to get TinyTennis, a Pong clone, running on your Xbox 360. Welcome to part 2 of the introduction to XNA series. Last time we converted the TinyTennis sample to use the XNA framework for rendering and keyboard input. However at the time that article was written deployment was not available on the Xbox 360. In this article you will make additional changes to the project to enable the game to be deployed and played on your Xbox 360. Some people have asked why I am using such a simple game for these articles. My reasoning is that I do not want to introduce many new things at the same time. TinyTennis is a very simple game and the GDI version has been on MSDN for a long time now and is well documented so I do not need much explanation. 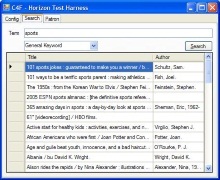 Future articles will use more advanced code such as the SpaceWar starter kit. Firstly an update to part 1. 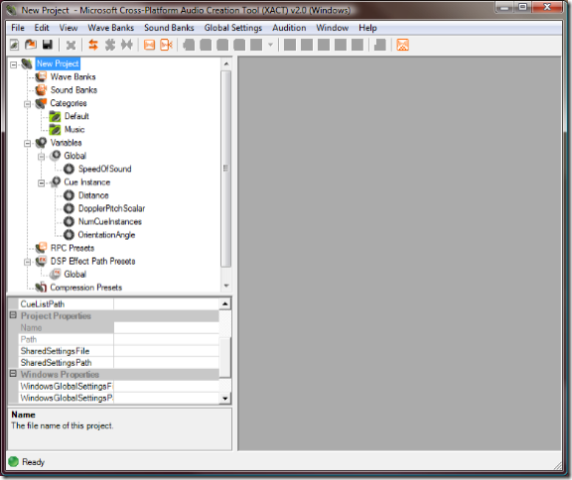 In the rush to get the article out at launch date I converted all the GDI PointF structs into XNA Point structs. This meant that everything was stored as integers rather than floating point values. The rounding is not noticeable in a game this simple, but it was incorrect. The correct thing to do was convert to XNA Vector2 structs and this has been corrected in the article and the code for part 1. Those of you with an Xbox 360 will notice that there is no keyboard so controlling the paddles will be a problem. In fact the Xbox 360 does support a standard USB keyboard if you plug one in, its just that very few games look for this input device so there is little point in coding for it and certainly no point in mandating it. All Xbox 360 games of course work with the gamepads and TinyTennis will be no exception. Xbox 360 gamepads work on the PC as well as on the Xbox. If you have wired controllers you can just plug them in to a vacant USB port and let Windows download the drivers. If you have wireless controllers then you need to buy the wireless controller adapter for windows. Note that the charging pack looks like it has a USB connection but that is purely to take electricity to charge the controller - it won't allow you to use the controller on Windows. In addition since the XNA framework only supports the XInput API you can ONLY use controllers that support this API. In general right now this is Xbox 360 controllers. 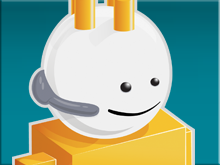 Any older controllers rely on the DirectInput API which is not available in the XNA framework. Reading the gamepad is as simple as reading the keyboard in XNA. You simple get the current state of a particular gamepad using the PlayerIndex enumeration (one, two, three or four corresponding to the players) and then read strongly named properties from the gamepad. Finally change the humanMove function in bat.cs to read the gamepad state for the correct gamepad. TinyTennis only has one sound for when the ball bounces. The code currently uses the SoundPlayer class from System.Media. Unfortunately System.Media is one of the assemblies which is not availalbe in the version of the .Net framework on the Xbox 360. 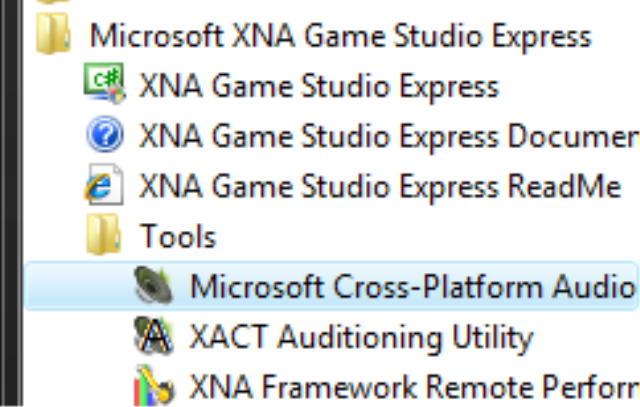 The only audio API available on the Xbox is called XACT and its exposed in the Microsoft.Xna.Framework.Audio namespace in the XNA framework. In addition to being the name of the API, XACT also contains a fairly complex sound management tool. 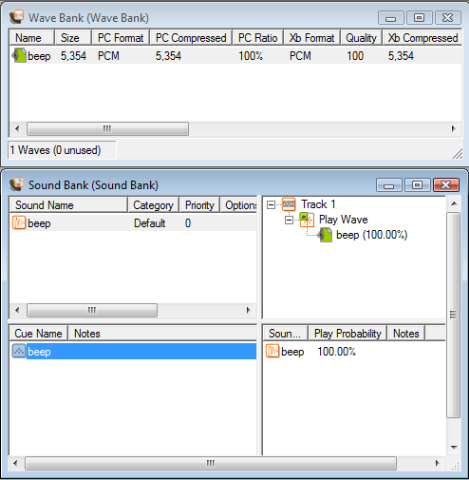 In AAA titles the sound guy on the team uses XACT to create a bank of sounds that the programmer can simply play by referring to a 'cue'. The idea behind it is to separate the work the audio guy does away from the programmer in the same way as a 3D modeling tool allows an artist to work away from the programmer. 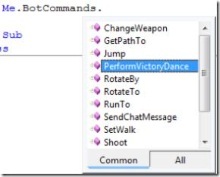 If this sounds too complex just to play the bounce sound then you are right - XACT is overkill for this. But its the only way to play sounds at the moment, and thankfully you do not need to learn very much XACT to be able to play a WAV file. Start by running the XACT tool from the start menu. 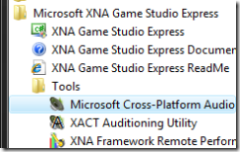 Note that you MUST use the version of XACT that ships with XNA Game Studio Express and not one that you may find in a DirectX SDK. The file formats for XACT projects changes almost every SDK release and the XNA framework only understands the one it was shipped with. 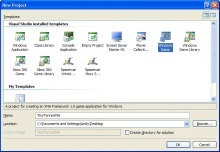 Also note that if you are running on Vista you should follow the instructions on Dave's blog to get it to work, and also set it to run as Admin. A future release of XNA Game Studio Express will make everything compatible with Vista. 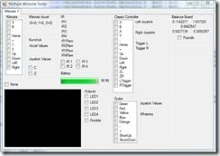 Soundbank: This contains the 'cues' that you, as the programmer, will play. In the case of TinyTennis the 'cue' will just play the raw sound file but XACT gives an audio engineer a lot more flexibility than that such as merging multiple sound files, changing the pitch and volume and applying reverb effects. You will now see the wavebank and the soundbank windows appear. 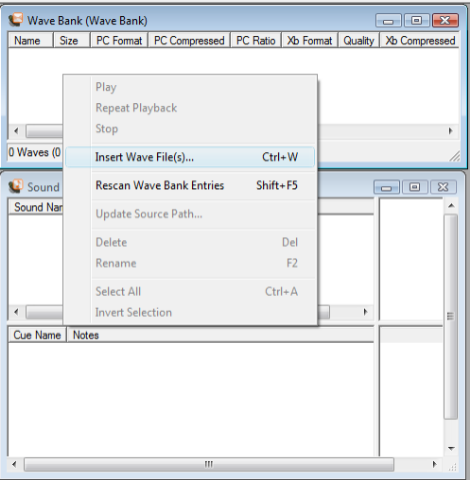 Add the beep.wav from the project directory by right clicking the wavebank window and selecting Insert Wave Files. 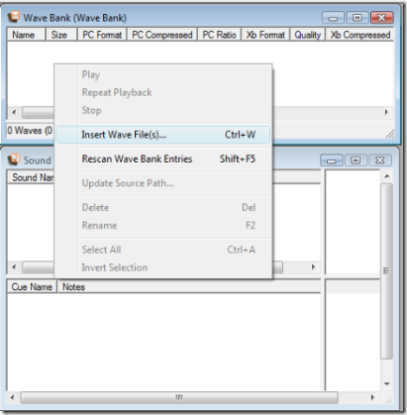 In Windows XP you can drag and drop from Windows Explorer into the wavebank window. What you have done is created an XACT cue that plays a sound which just contains a single wave file. XNA Game Studio Express understands .xap files and will compile correct Windows or Xbox 360 versions when the project is compiled. So the only remaining thing to do is add the .xap to the project. Simple browse and add. Since the .xap file knows which .wav files are required you do not need to explicitly reference beep.wav any more so it can be 'excluded from project' (Do not use 'delete' as that will actually remove the file from disc and the .xap file references it). Playing the sound is a little more complex that the 2 lines of code required with the SoundPlayer class but its much more flexible. For a start you can have more than one sound playing at a time which is not possible with SoundPlayer. In ball.cs you can remove the using statement for System.Media and add in Microsoft.Xna.Framework.Audio. Then remove all of the places that _beep and SoundPlayer are used. 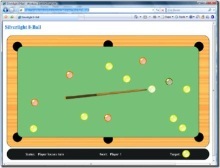 Compile and run and after all of that hard work you should be back exactly where you started, with the ball playing a beep sound when it bounces. Game Studio Express requires you to have separate projects for Windows and Xbox 360 development. For almost all XNA framework projects the source code is identical between the two versions - any slight differences can be handled using #if XBOX - so maintaining 2 code trees is almost always more trouble than it is worth. The easiest way to get round this is to create both projects in the same directory so that they can share files in a simple manner. You will still have to remember to add a file to both projects when you make a new file but that is a simple drag and drop operation. Firstly create an empty Xbox 360 Game project somewhere on your hard drive - its a temporary location so anywhere will do. 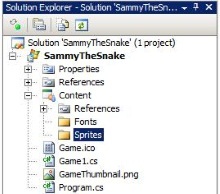 Then using windows explorer copy the .csproj file into the TinyTennisXNA folder and add it to your solution as a second project. It will complain about the source files that are missing but that doesn't matter as we will add our own. 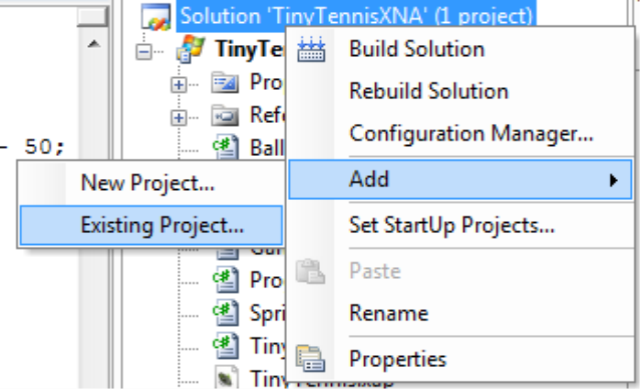 Rename the project to TinyTennis360, remove Game1.cs and then drag and drop all the files from TinyTennisXNA into TinyTennis360 - from within the solution explorer. Even though the files are in the same directory they will get added to the new project. Now if you modify bat.cs in one project it automatically gets updated in the other project too. The only thing you have to do to keep in sync is remember to drag and drop any new files if you add them to one of the projects. Also remember that now you have 2 projects you need to remember to set the right one to be the startup project by right clicking the project file. You will get confused when it tries to run the Xbox project and deploy when you really wanted to debug the windows one. Now that everything compiles its time to deploy it to the Xbox. Rather than explain how to do it in words and pictures I recommend you take a look at the second half of the Getting Started with the XNA Creators Club video. If you fast forward to 6:02 you can see a demo of how to create the connection between Game Studio Express and your 360 and how to put your Xbox in receive mode. Once that is done you just hit f5 in Game Studio Express and the game will be deployed and run. Depending on what screen resolution you have set on your Xbox the paddles may not appear in the expected place, but the game is still playable. To quit the game on the Xbox 360 press the 'back' button on gamepad 1. Next time I will cover some additional features for the Xbox version and add the scores back in. The ZMan runs the #1 Managed DirectX & XNA community website http://www.TheZBuffer.com. If you have a question for the ZMan that you would like to se answered in a future column then send it to zman@thezbuffer.com.